Part of a team, part of the family. Start your career with Gunter Pest today. 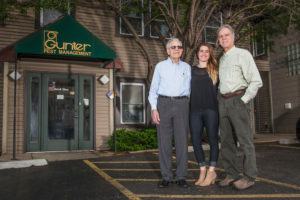 Gunter seeks out the best of the best to join our team and start careers, and over the years, we’ve managed to keep a family-like atmosphere for our employees. Each member of our team is extremely valuable and brings a special personality or skill set to the table. We are always looking for motivated individuals to join the Gunter Crew. Feel free to send us an email at info@gunterpest.com with your resume attached. Gunter Pest and Lawn is a family-owned business, and all employees are treated like and interact as a family. We’ve been in business since 1950 and are the oldest, largest local pest control company in the Kansas City Metro Area. We pride ourselves on professionalism, expertise, and a friendly staff. Because we are the oldest pest company in Kansas City, we hold our technicians and office staff to the highest level of expectation regarding performance and customer service. We do not require experience from a starting-rate technician, rather we look for applicants with strong character values who are interested in building a career at Gunter, are dedicated to seeking growth, and motivated to perform at a high level every day. Our 70,000 Kansas City customer base is very important to us, and our technicians are on the front lines every day interacting with them – so it’s very important that our technicians not only perform the tasks required of the position but equally important that they like and are motivated by their job! What values do we look for in our employees? Competitive hourly wage plus commission and benefits! Inform customers on how to work with us to eliminate pests in their home or office through proper sanitation, storage, and landscaping. When our staff meets sales goals determined by owner/CEO/GM, our entire team is taken on a fun trip – all expenses paid for by Gunter as a Thank You for hard work and dedication. Our recent bonus excursion was to Cancun, but we’ve also been on cruises to Jamaica and The Mexican Riviera! *We perform a criminal background check, motor vehicle record check, and drug screening on all potential employees.